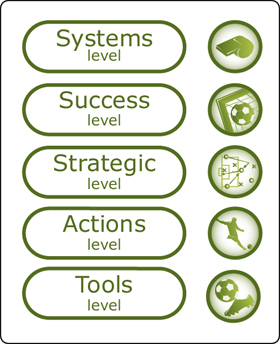 The 5-level framework is a model for planning in complex systems. It allows us to be deliberate and thoughtful in our journey toward sustainability. We will use a game analogy throughout these levels to help clarify the differences in scope and content. Identification of the scope of the system we’re dealing with. In the case of a game, the system would be the playing field and all of it's components. In terms of sustainability, the system is the entire biosphere. So we need an understanding of the way our system works. This can be found on our science page. The Funnel – a core concept at this level is the idea that we are currently operating in a “funnel”. The funnel is a metaphor that helps us visualise the economic, social and environmental pressures that are growing on society as natural resources and ecosystem services diminish and the population’s number and consumption grows. For more on the 4 system conditions / sustainability principles. These are some strategic guidelines for organizations to follow in implementing the framework and taking actions towards sustainability. Following our game example, this level would be the strategizing level as the team members come together to plan a goal. The most important strategy to focus on is backcasting from principles: it consists of establishing a vision of the organization in the future where the four sustainability principles are not being violated and then ‘backcasting’ to the present to see what specific actions should be taken first to start strategically working towards that vision. These are the concrete actions that are taken on the path to sustainability. Depending on the nature of the organization, they could include things like phasing out fossil fuel use by switching some capacity to renewable energy, or substituting metals that are naturally abundant in the biosphere and therefore benign for ones that are scarce and potentially harmful. In our game analogy, actions would be moving towards the net to score a goal, passing to team-mates, etc. Here we find a variety of tools that help organizations manage their path towards sustainability. Certain tools are effective in different situations, but a lot of them work well together and create synergies when utilized within the context of the framework. They include Environmental Management Systems, ISO 14001, Life Cycle Assessment, Factor 10, Natural Capitalism, Ecological Footprinting, Zero Emission, etc. A lot of these tools have great organizations behind them and are helping organizations with various environmental and / or sustainability initiatives. In our game, tools would be the monitoring equipment that athletes use, their fitness equipment and any strategy books they can get their hands on.